Uma Maheshwaram, also known as Maheshwaram is a temple dedicated to Lord Shiva in Telangana, India. It is located in picturesque Nallamala forest ranges and situated 100 kilometers away from Hyderabad on the key Hyderabad-Srisailam highway. 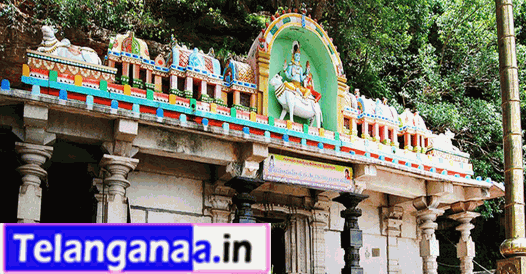 Umamaheshwaram is also considered the northern gateway of Srisailam and as one of the jyotirlingas. This place finds mention in many Vedic scriptures and it is believed that a visit to Srisailam without visiting Umamaheshwaram is incomplete. It is located atop a hill and covered by huge trees from all sides. The hill ranges shield the temple including the 500-metre stretch to Papanasanam. Throughout the day there is hardly any sunlight, which falls on this stretch, thereby maintaining the temperature below the normal year round. It is also called Poor Man's Ooty. The Sri Uma Maheshwara Swamy Temple in Mahabubnagar consists of a Shivalinga, which has two colours, which is white on one side and red on the other. There is a huge tank near the temple. The history of Umamaheshwara Swamy temple dates back to 2nd century AD and it was believed to have been built during the reign of Maurya Chandragupta. The deity in this temple is believed to have spotted in naturally formed cave. The continuous flow of water from the hillocks that falls on this beautiful temple, gives an impress as if Goddess Ganga is bestowing her purity here. Uma Maheshwara Swamy temple is located near Achampet in Mahabubnagar district, in the picturesque Nallamala forest range. It is around 100 kilometers away from Hyderabad on the Hyderabad-Srisailam highway. There are many budget hotels and eateries operating near the famous temple. Tourists can stay at Hyderabad or Mahabubnagar, before they take the trip to Uma maheshwaram. There are even few options for stay at Budget hotels near the temple.